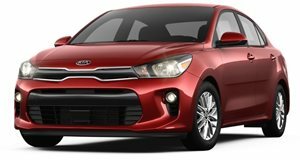 The 2017 Kia Rio is available with a 1.6-liter engine, power outputs are 138 hp and 123 lb-ft. Drive is sent to the front wheels through either a 6-speed manual or automatic transmission. Three trim levels and either a hatchback or sedan body style cover most of the bases and the Rio offers strong performance and commendable interior space too. Notable features in the subcompact category include a power sunroof, 7-inch touchscreen, leather seats and a rearview camera and air-conditioning and split-folding rear seats are standard across the range. 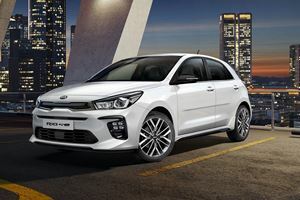 The Kia Rio is a subcompact family car aimed at the budget-conscious shopper, base models offer excellent value for money and the generous interior proportions and long warranty make for a very practical car. Not much has changed for the 2017 model year other than a minor reshuffling of trim levels. The Rio offers comfortable seating for four in both the sedan and hatchback body styles. The cargo area is large in both variants too, with the sedan offering a low lift-over height and fold-down rear seats are standard on both. The interior design is basic and functional but the soft-touch dash on higher trim levels and the available leather seats (standard on the SX trim) do add a touch of luxury. Both the sedan and hatchback offer a decent ride over most surfaces and tackle bends with reasonable competence. The hatchback SX trim comes equipped with sportier suspension settings and larger alloys, this does sharpen up the handling but do cause the car to feel less settled over bumps. There are more accomplished vehicles in this class when it comes to handling but the Rio, especially with its standard 15-inch wheels, is perfect for city driving duties. 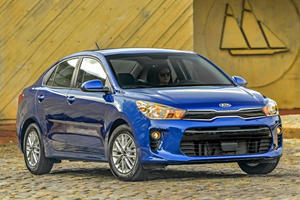 The Kia Rio is available with a 138 horsepower 1.6-liter inline-four engine. It produces 123 lb-ft of torque and powers the front wheels. A 6-speed manual transmission is standard on the base LX while a 6-speed automatic is standard on the rest of the range. Acceleration to 60 mph takes under 9-seconds which is good for this segment and the Rio feels responsive and eager in most gears. Fuel consumption is decent to if not exactly class-leading, with the manual transmission offering an average of 31 mpg and the automatic slightly less at 30 mpg. There are two trim levels on the sedan, namely the LX and more luxurious EX, while the hatchback offers these and adds a more sporting SX trim. All versions excepting the LX sedan are fitted with the 6-speed automatic transmission. LX trim includes a 4-speaker audio system incorporating Sirius satellite radio, USB and auxiliary jack, 15-inch steel wheels, air-conditioning, trip computer, woven cloth seats, with split folding rears. EX trim comes with all of the above and is standard with the 6-speed automatic transmission, fog lights, 15-inch alloy wheels, 6-speaker audio system with Bluetooth compatibility, cruise control, center console, keyless remote, premium cloth seat trim, soft-touch dash and power windows. A number of these items are available as individual options on the LX trim level as well as cloth/leather combination seats and premium pearl paint. Certain features such as a 4.3-inch touchscreen display, rearview camera, auto light control, stop/go system and Uvo infotainment system are available only on higher trim levels. A Designer Package for the EX offers the 4.3-inch touch screen and rear camera display as well as interior trim changes while the EX Eco Package is designed to improve economy and curiously removes items such as the front foglights, LED map lights and soft-touch dash while adding auto light control, Uvo entertainment, rearview camera, stop/go system and an all-important Eco badge. SX trim includes most of the above (excluding the Eco package options) and adds 17-inch wheels, sport tuned suspension, power sunroof, power folding exterior mirrors, auto light control, LED daytime running lights and taillights, rearview camera, 7-inch touchscreen with navigation, push button start, paddle-shifters, aluminum pedals and leather seats. For those looking for an honest and capable subcompact with above average performance and interior space, the Kia Rio should be at the top of their list. The basic interior can be complemented by a range of available options although the low-frills base LX offers a strong value proposition too. If only it was a true hot hatch. 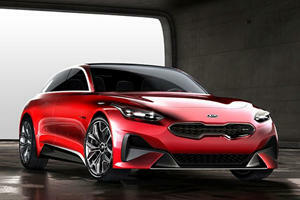 Or an “extended hot hatch,” as Kia likes to call it.